Posted on August 26, 2015 by F.D.I.T. Oh sleep, sweet sleep is at a premium around my house. My wife is in the third trimester and has been hit with a trifecta: heartburn, Braxton Hicks contractions and a very active baby. All conspire to create a recipe for no sleep. It also means no sleep for me. I try to do what I can to make it easier but honestly there is nothing I can do and I have to tell you I feel pretty powerless. About all I can do is pray that she can get through it. 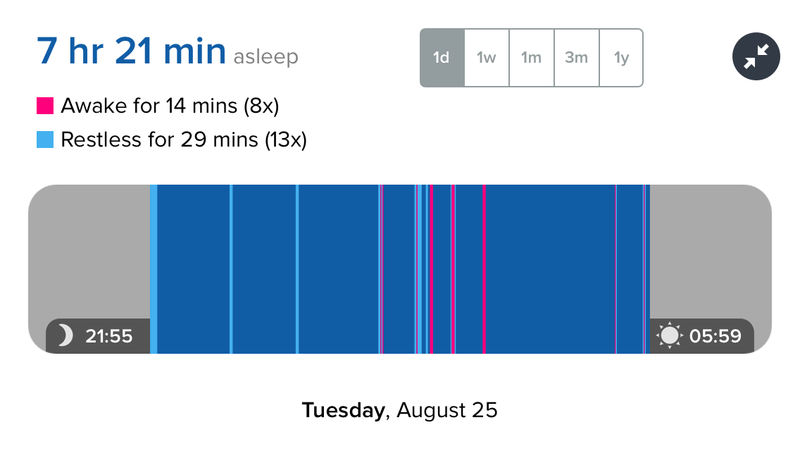 Even though my Fitbit says I got 7 hr and 21 minutes a lot of those “sleep” minutes were actually praying minutes. Even with a bad night’s sleep I got my workout done and in fact the exercises helped keep my alertness level up and get my work done. I even added two extra man makers in my last set. God Bless and go get some sleep. It’s good for you.